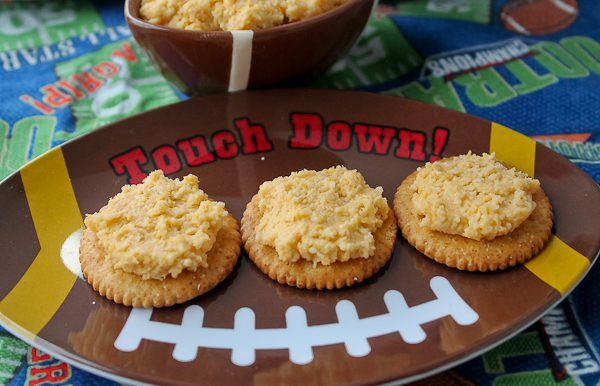 I always let my Bill plan out what he wants to eat on Super Bowl Sunday. First thing he said was, “To start with, something cheesy to have with a beer.” I decided to combine the two and it turned out delicious! Grated Cheddar and Swiss are placed in a food processor along with a minced clove of garlic, dry mustard, and Worcestershire sauce. The beer is added gradually and processed until smooth and spreadable. That’s it! It’s great served with crackers or veggies, or even as a sandwich spread. I made it today so it could sit overnight for the flavors to blend, but it must be taken out to come to room temperature before serving or it’s way too stiff. I’ll probably take mine out in the morning and let it sit out in the covered container until game time. Stir again before serving. 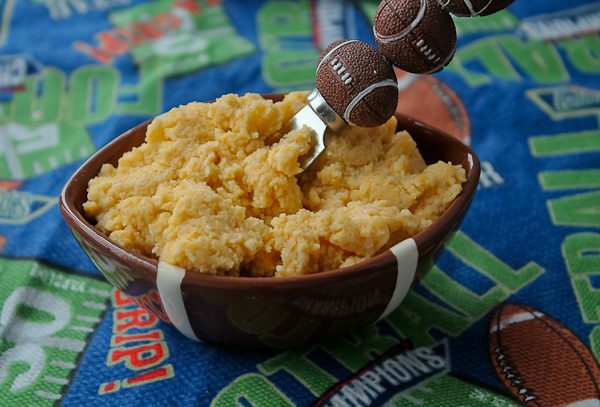 When your family or friends taste this, they will say TOUCHDOWN! Place cheeses, garlic, Worcestershire, and dry mustard in bowl of food processor. Process until well blended. Gradually add beer until mixture is of desired spreading consistency. If you feel it needs more beer after the ½ is added, add more very little by little. If you add too much, it can't be fixed and will be watery! 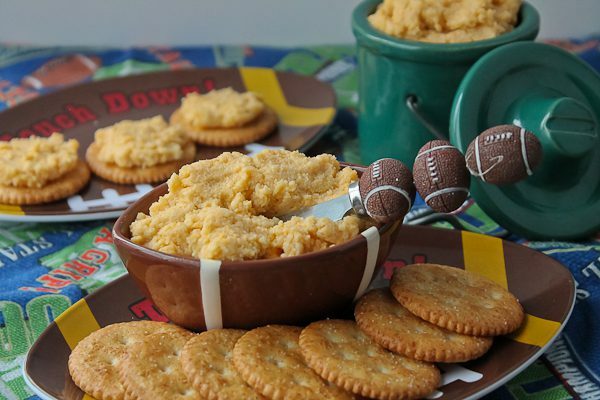 Spread can be served right away, or can be refrigerated a day or so. Be sure and completely bring to room temperature before serving or it will be too hard to spread. Serve the cheese to be spread on crackers or baguette slices, or with fresh veggies. Recipe makes about 2-1/2 cups. *Note: Do not use pre-shredded cheeses. Buy in blocks and shred yourself. It makes a huge difference! Yes, yes, yes. Wish I had seen this earlier today. Definitely on my list….with veggies of course. It doesn’t have to sit overnight. Also great right after being prepared! There’s enough flavor right away.